The Holmes brand was introduced in 1982. Holmes air purifiers are lower-market models found at big box retail outlets, notably Wal-Mart, Target, and Bed, Bath and Beyond. These "department store air purifiers" are second in the entry-level market segment to the Honeywell brand, but retain significant market penetration. In 2005, Jarden Corporation bought The Holmes Group brands, including Bionaire and Holmes air purifiers, along with other housewares labels. With other acquisitions, Jarden has a global portfolio of over 100 brands. Jarden Corporation stock is publicly traded (JAH‎ - NYSE) and a member of the Fortune 500. Jarden's main corporate office in Rye, N.Y., coordinates the activities of over 25,000 employees worldwide. Holmes air purifiers are sold through Jarden Consumer Solutions (JCS). The Holmes brand air purifiers do an acceptable job of air purification, when used in small enough installed spaces. However, Holmes air purifiers are sold using a "razor and blades" marketing model. A recent well-publicized example was the low-priced inkjet printer, which sometimes sold for less than the frequently-needed replacement ink cartridges. The purifiers are sold at competitive prices, to naive first-purifier buyers who have not thought ahead to the long-term costs of ownership of a Holmes. The loss-leader air purifiers then generate a continuous revenue stream from high margin consumables - replacement filters. Jarden has been very successful with the brand-turnaround strategy, doing $1.74 billion in sales in the fourth quarter of 2011. These Made-in-China Holmes air purifiers have numerous quality control issues - buyers must retain proof-of-purchase and register with Jarden to get warranty coverage. On lower-priced Holmes models, shipping costs, borne by the user, often outweigh benefits of warranty claims. Buyers at this level could also consider the Honeywells, which outsell the Holmes air cleaners. The main advantage of choosing Holmes is replacement filter security. Holmes air purifiers use a modular filter arrangement. One style of filter fits a series of air purifiers, which may include Bionaire models, doubling, tripling, or quadrupling the same filter to fit each successive air purifier. Gaps where two filters join are generally hard to seal well, especially when inexperienced users must install the filters infrequently. These gaps often allow unfiltered air to pass through the air purifier. Weak prefiltering allows large dust to clog HEPA filters quickly in the Holmes and Bionaire air purifiers. Buyers should know the substantial difference in filtering performance between true-HEPA and HEPA-type air purifiers. True HEPA filters capture 99.97% of .3 micron particles. Typical HEPA-type filters may be rated for particle sizes many times larger, to 2.0 microns. Note that 2.0 micron filters can be very beneficial to pollen and mold allergy sufferers because pollen and mold spores are big enough to be captured by the HEPA-like filter. Folks with smaller allergy triggers or smoke will often be less satisfied with the Holmes HEPA-type air purifiers. HEPA-type filters, AND True-HEPAs installed too loosely, will allow fine particles to slip around the filter's edges (bypassing), slowly building-up inside the air purifier, eventually making it a polluter. To prevent this, buyers should plan on cleaning the interior of the air purifier about every six months. Holmes purifiers have higher than average ozone emissions, electromagnetic fields (EMFs), noise, and break-in odors. Holmes air purifier brief reviews are listed below. Where there is a full length review, it is linked. NO Holmes products appear on the current AHAM Clean Air Delivery Rate (CADR) list, so CADRs quoted below are from manufacturer and vendor pages. But with fake woodgrain and black plastic, Holmes WAP532 looks like a stereo speaker from the 70's. CADR (clean air delivery rate) is quoted at "140 CFM," with room size "up to 217 cu. ft."
WeMo can be visualized as an ecosystem, if you find a device/peripheral that says WeMo, it can be controlled via the WeMo app. The 532 purifier is WeMo enabled, but it does work without Wemo. Download the app, from your Apple app store, Google Play, or Amazon app store. Schedule the air purifier to start at different times each day, check air quality, and receive alerts, from anywhere. Wemo platform in general is "buggy," "unstable," a "disaster." One of many user beefs: "scheduler works when the air cleaner is in an off state. If it's on, it will completely ignore the schedule, even if the schedule is enabled." Auto mode adjusts settings based on sensor derived air quality, alerts the owner when filters need changing. Wemo collects personal information at the outset, and in real time. Holmes WAC532 does NOT have IFTTT (if this than that, www.ifttt.com) integration. Amazon has around 100 "buyer reviews," 90 of them were Free product feedbacks. Users may manually control the 532. Just 2 buttons adorn the case, fan speed adjust and ionizer on/off toggle. Tapping the fan button steps the motor through 3 fan speeds, Auto Mode, and off. Holmes 532 does have an ionizer, which does emit some ozone. Filters are TWO True-HEPA, AER-1s, available in different types:. Holmes 532 ships with a allergen remover filter, and a odor eliminator carbon filter installed. Be sure to notice the shorter expiration times for the optional filters. Holmes AER1 True HEPA Filter (HAPF300AP-U4) at Amazon.com. Holmes 532 is a bit tall, at a height of 29.7 inches, but has a tidy foot print at 12.8 by 10.3 inches. Weighing 16.20 pounds, the tower is easy to move. However, 532 inhales in dirty air through the front, and expels it from the back. This unfortunate design choice means locations are more limited, a minimum 12 inch clearance is required. So WAC532 is not quiet, even on low. And YOU are paying for the extra tech. Unless you are already Wemo literate, I'd skip the wifi model. Holmes True-HEPA WAP532 at Amazon.com. 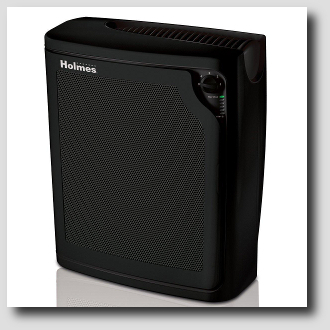 With a Smoke CADR widely cited (but NOT on the official AHAM listing) as 225, Holmes 8650B carries a True-HEPA filter. Manufacturer-recommended for spaces to 349 square feet, I would never install a Holmes 8650B in more than 220 sq. ft. This air cleaner is designed to entrap users in a filter-buying spiral - one user spent $85 bucks in less than 90 days. Numerous reviewers mention fine particulate dust exhausting from the 8650B and encoating the interior ("filter bypassing"). True HEPA filtration removes 99.97% of .3 micron airborne allergens from the air that passes through the filter. Holmes HAP8650B uses 3 True HEPAs, part number HAPF600D-U2. I would tape-seal the cracks and edges to reduce bypassing, trying to at least double the 12 month typical HEPA life. Atop the 3 HEPAs sit 3 carbon filters, part number Holmes HAPF60-U3 Carbon Filter. Again, there are multiple seams and edges designed to let particulate seep by - I would tape seal the edges and cover with a one-piece layer of window screen. Four speed settings provide alternatives, but shoppers should NOT expect silence from a 225 CADR Holmes 8650B. User reviews say 8650B is very noisy on high, and some even think the lowest setting is too loud. Holmes has thoughtfully added a LED Progress Bar to remind users when filters need replacement. Measuring 22.8 inches high by 10.2 deep and 20.9 inches tall, Holmes 8650B weighs 19.4 pounds. Inhaling from the front and exhaling at the top, 8650B can be placed pretty close to a wall. 8650B is Energy Star rated. Numerous reviews say the cabinets will not close effectively, causing the safety switch to trip. A bit of tape will remedy this, but it serves as a quality indicator. Holmes HAP8650B-U True HEPA at Amazon.com. "Holmes® HAP726-U True HEPA Allergen Remover for Medium to Large Rooms" looks just like its bigger brother HAP-756U. The advertised room size is "to 256 sq. ft."
Like all room size ratings based on 24/7 top speed operation, this is far too big. 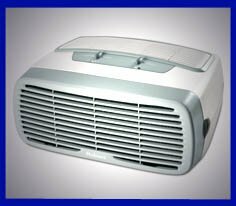 I recommend HAP726-U for 160 square feet, where it will provide clean air when run on noisy high speed much of the time. Those who plan to operate the HAP726U on quieter speeds should downsize the installed space accordingly. 726U is a true-HEPA using two standard HAPF600D filters set side by side. Odor removal is supplied by an Arm & Hammer baking soda prefilter. Replacement filters are widely available, and are needed at least once a year - much more frequently in smoke/pet/odor situations. Holmes HAP756U is the bigger brother to HAP726U - photos look identical, until both Holmes purifiers are photographed together. HAP756U is advertised as AHAM CADR rated at 270, with a recommended room size of 418 sq. ft.
That 270 is a decent CADR, but the room size is based on continuous high speed operation, impossible without earplugs, which some user reviews admit to using. I recommend 260 square feet as the largest installed space for Holmes HAP756-U. 756U needs three HEPA replacement filters, at least once annually. Holmes® HAP756-U True HEPA Allergen Remover at Amazon.com. HAP-242 has been around for many years in essentially the same cheap, compact, and reasonably portable form. Holmes HAP-242-UC carries a loosely-mounted 2.0 micron (NOT .3 micron) HEPA-TYPE filter. TRUE-HEPAs MUST retain "99.97% of the .3 micron particulate allergens that go thru the filter, (note that air could possibly go through the purifier without going through the HEPA). Holmes 242 is a HEPA-type air purifier, "99% filtration" is printed on the box. HEPA is a nationally defined "filter efficiency standard," a pure percentage is meaningless jargon, and 99% is seriously an insult. HEPA-TYPE filters are NOT HEPA, NOT, NOT, NOT. I have four of the ever-popular, $34 entry-level Holmeses. I use the group (Holmes) with modified filter trains to collect large dust only ahead of expensive IQAir True-HEPAs. Most shoppers in this bottom price range are unfamiliar with CADR's, these are in the bottom third of air cleaners certified. Official AHAM room size rating is room size to 109 square feet, too big as always. Remember to room size the smaller purifier to one room size square foot per dust CADR, especially if even one household member is noise sensitive. Holmes HAP242-UC HEPA-type Desktop Air Purifier at Amazon.com. HAP412N-U is a small "tower" air purifier with a HEPA-Type filter. This is a 2.0 micron filter, it allows the vast majority of airborne particulate (and most of the chemical vapors) to zoom on through. A three-speed fan and user-controllable ionizer round out the picture. Advertised for rooms up to 120 sq. ft., based on a Smoke CADR of 76, Holmes HAP412N-U has a filter using Arm & Hammer Baking Soda for odor removal. Manufacturer recommendations call for main filter changes every 3-4 months. User reviews are generally favorable, but many notice that running the ionizer function can generate black soot on light colored objects near the HAP412N-U. Several user reviews say that NO dust ever accumulates on the HEPA-type filter. Holmes HAP412N-U is poorly sealed, but these users most likely have the filter installed improperly, allowing air leakage past the filter. They can ship from the factory with a misaligned filter, so users should check for tight filter seating. Weighing just 9 pounds, and measuring 15.7" x 11.5" x 8.2," HAP412N-U is conveniently portable. The smaller footprint of the tower adapts well to personal space, like a small office or work cubicle. HAP9412B-U Small Room air purifier has three speed settings. It is sold as suitable for rooms as big as 110 sq ft., based on advertised CADR of 70. I recommend HAP9412B-U for a maximum of 65 square feet, best for an office cubicle. A washable foam prefilter precedes the HEPA-type filter which captures 99% of particles as small as 2.0 microns. Again, a TWO micron HEPA-type (NOT .2) is suited only for mold/pollen allergy, everything else will zip right through. The filter is fortified with Arm & Hammer® baking soda for odor reduction. An optional negative ionizer is user-controlled. HAP9412B-U's filter life monitor runs approximately four months before flashing to prompt users to change the HEPA-type filter. Measuring 8.9 x 8.5 x 17.7 inches and weighing under seven pounds, the pyramid-styled HAP9412B-U can fit in to tight spaces and won't disrupt decor. Holmes® HAP424-U has two vertically stacked 2.0 micron HEPA-type filters wrapped in an attractive tower style case. Another TWO MICRON fake filter, just waiting for a buyer. Three speed settings and a Smoke CADR of 116 yield an official room size rating of 180 square feet. I like it for 110 square feet, tops. HAP424-U also has the baking soda deodorizer. HAP424-U will need two HAPF30 replacement filters approximately every four months. The tower weighs 11.4 pounds, making it easy to transport. At 26.6 inches tall, and a base of 9.5 by 6.5 inches, Holmes HAP424-U may be too tall for bookshelf installations. A larger percentage of user reviews mention noise, as compared to other Holmes purifiers on this page. I think this is primarily due to the higher power of the HAP424-Us.